Questions posed to Shanahan during a HASC hearing speak to the complicated debate that is unfolding on Capitol Hill as the Trump administration seeks authorization to create a new military service. 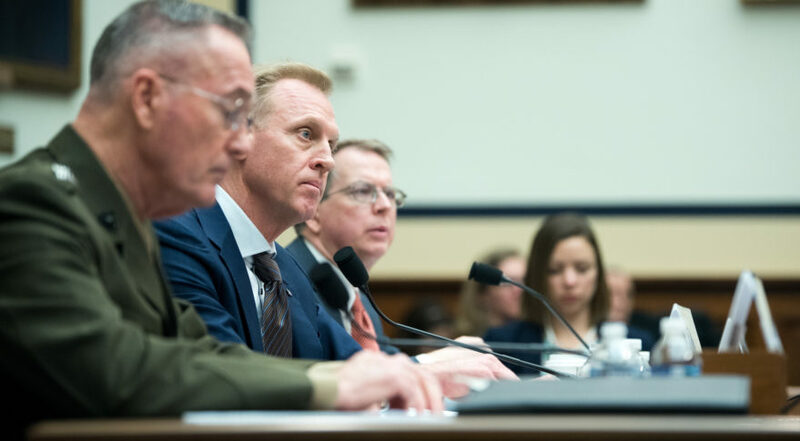 WASHINGTON — Acting Defense Secretary Patrick Shanahan on Tuesday fielded questions from lawmakers about three separate space organizations the Pentagon is pursuing: U.S. Space Command, the Space Development Agency and a Space Force. When pressed by Rep. Mike Rogers (R-Ala.) to rank them in order of priority, Shanahan said the first two were the most urgent. “I would push forth standing up of the U.S. Space Command because it’s the easiest and most impactful, followed by the Space Development Agency,” Shanahan said during a House Armed Services Committee hearing where he testified on the fiscal year 2020 defense budget request alongside the chairman of the Joint Chiefs of Staff Gen. Joseph Dunford and the Pentagon’s chief financial officer David Norquist. The White House on Tuesday nominated Air Force Gen. John Raymond to lead U.S. Space Command, even though the actual command has not been officially stood up yet. The space-related questions posed to Shanahan during the hearing speak to the complicated debate that is unfolding on Capitol Hill as the Trump administration seeks congressional authorization to create a new military service while DoD in parallel is moving to establish a combatant command for space and a new agency to oversee space technology development. Shanahan faced the committee just hours after HASC Chairman Rep. Adam Smith (D-Wash.) released a scathing rebuke of the Pentagon’s Space Force proposal and suggested the committee would pursue other alternatives. Neither Smith nor Ranking HASC member Mac Thornberry (R-Texas) mentioned the Space Force issue during the hearing. Among the objections that Smith and other lawmakers have raised about DoD’s proposal is that it creates a large military bureaucracy, with a space branch led by four-star chief and vice chief of staff, and a civilian undersecretary. Members have questioned why all this is needed to advance space capabilities. Rogers is the former chairman of the HASC strategic forces subcommittee and has played a key role in advocating for a separate military branch for space. During his Q&A with Shanahan, Rogers hinted that one of the options HASC might be looking at is to create a Space Force not as a traditional military service but as an independent command that organizes, trains and equips forces for space operations. That approach is often referred to as the “SOCOM model” because it is similar to how U.S. Special Operations Command is structured, with unique authorities to train forces and acquire weapons systems outside the cumbersome Pentagon procurement process. The committee has been studying this issue for months. Then HASC Chairman Thornberry last fall asked Shanahan to submit cost estimates for different approaches for organizing a Space Force. One was the “Special Operations Command-based model,” according to a memo sent to Shanahan. This would be a Space Force that, like U.S. SOCOM, has authorities to organize, train and equip for space capabilities but would be led by a senior civilian. In response to questions from other members of the committee, Shanahan gave a forceful justification for why the U.S. Space Command and the Space Development Agency are urgent priorities. The United States, he said, needs a combatant command dedicated to space as the nation’s dominance in space is being challenged by Russia and China. A single-minded focus on space warfare is necessary for national security reasons, he argued. Similarly, Shanahan spoke about the Space Development Agency as a pressing need to expedite the acquisition of new technology. The Pentagon’s plodding procurement process, he noted, does not allow for the rapid innovation that is required to stay ahead of China and Russia. The discussion at the HASC hearing echoed what Pentagon officials have heard from lawmakers and staffs in private meetings over the past few weeks. According to DoD sources, many of the questions are about why the Pentagon needs both a Space Command and a Space Force. Rep. Kendra Horn (D-Okla.) asked Dunford to explain how a Space Force or a Space Development Agency won’t slow things down simply by adding more organizations to the mix. Dunford said DoD needs to do a better job developing space capabilities and that the current system is inefficient. “That is the foundational argument for the Space Development Agency,” he said. On whether a separate military service is needed, he said it makes sense to have an organization that has “a singular focus, has a responsibility for identifying, training, equipping people.” A service also would ensure that resources are not taken from space to pay for other programs. “There’s always that temptation,” he said. But Dunford acknowledged that having a four-star general on the Joint Chiefs of Staff is no guarantee that space will get more attention. There is now a broader understanding that space is important and the tone of the dialogue in the Pentagon reflects that, said Dunford.